The TBS cable network agreed in 2010 to shell out top dollar for reruns of theCBS CBS -1.40% hit comedy “The Big Bang Theory.” The bet paid huge dividends, as the show made TBS one of the most-watched cable channels. So in 2012 TBS committed to write an even bigger check for another CBS comedy, “2 Broke Girls,” hoping it would become the next big thing. It didn’t. TBS won’t start airing the reruns until next year but the show’s audience has fallen 20% on the broadcast network since the licensing deal was struck, according to Nielsen, suggesting it won’t be the ratings workhorse TBS expected. This episode highlights one of the biggest threats facing cable channels, which in recent years have been cash cows for the big U.S. entertainment companies. Cable channels had a low-risk but lucrative business model: fill much of the schedule with reruns of shows that were proven hits on broadcast networks—CBS, NBC, Fox FOXA 0.00% and ABC—taking a lot of the guesswork out of programming. But that formula is no longer reliable. Audiences have fragmented so badly among myriad cable channels and online video outlets that broadcast networks are finding it harder to produce a hit. That means the pool of shows that can guarantee a strong audience in reruns for cable channels has shrunk drastically, driving up prices for what is available—even when audiences aren’t as strong. Most affected are the biggest cable channels, like TNT, TBS and USA Network, that have long aired mass-market entertainment programming most similar to broadcast networks. If those networks pay large sums for reruns that can’t bring in large audiences, ad revenue and profits will suffer. Cutting down on reruns by investing more in original programming, meanwhile, can also be costly if those shows don’t gain traction. That is why all the big cable networks are hoping for broadcasters to rediscover their mojo. The shrinking pool of rerun candidates is evident in broadcasters’ high cancellation rate: Just 29% of the broadcast TV shows launched in the 2013 season were renewed for a second season, according to analyst Michael Nathanson of MoffettNathanson Research. That renewal rate has averaged 35% since 2006. Early cancellations take shows out of contention to be sold in the rerun “syndication” market. That is because buyers are generally looking for 90 to 100 episodes—a threshold that allows them to air reruns for a long time without repeating any episodes. While those shows appeal to specific audiences, none qualifies as a reliable “blue chip” hit like “Friends” or “Seinfeld,” says Bill Carroll, vice president and director of programming at Katz Television Group. Executives at Time Warner Inc. TWX +0.12% ‘s Turner cable unit, which houses TBS, say the company is happy to have “2 Broke Girls,” especially given the supply crunch in the market. “When you look at the landscape there is very little available,” said Deborah Bradley, the head of program acquisitions at Turner. TBS will pay about $1.7 million an episode for the show, which centers on working-class waitresses with dreams of launching a cupcake business, Morgan Stanley estimates. That is more than the $1.5 million per episode TBS now pays for “Big Bang Theory,” a far bigger hit, with an average of 23 million viewers tuning into CBS’s telecasts, according to Nielsen. On CBS, “2 Broke Girls” has viewership of 10.1 million. 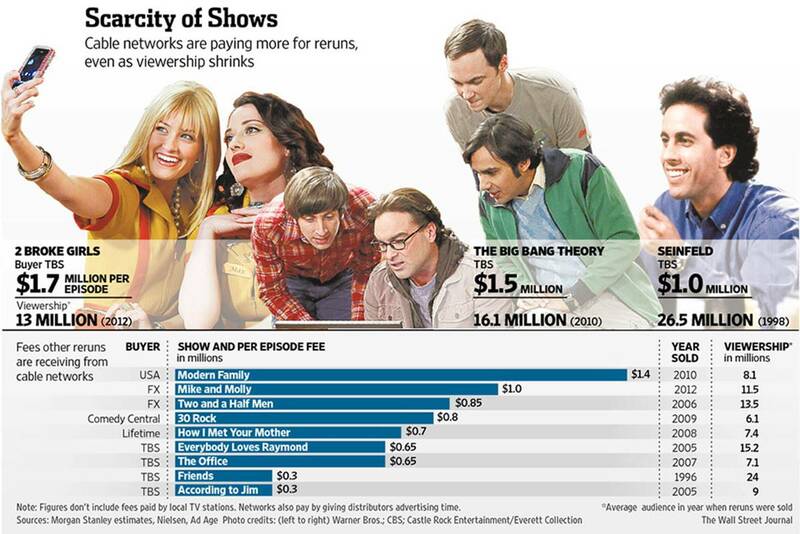 “Big Bang Theory” has proved its worth for TBS. 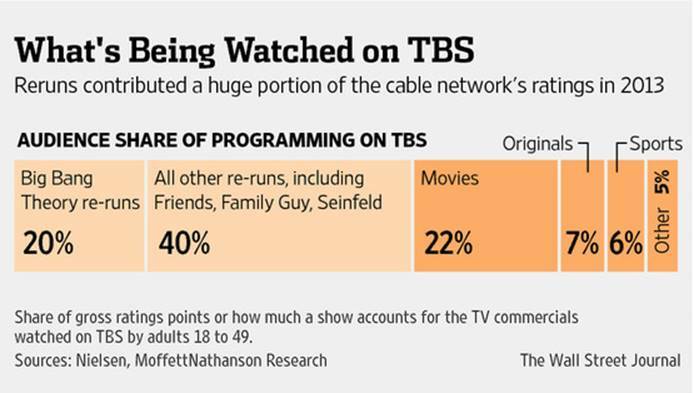 It draws a disproportionate share of TBS’ audience, accounting for 20% of all ads viewers see on the network, according to MoffettNathanson Research, even though the show makes up only 6% of programming hours. By contrast, USA Network is spending $1.4 million per episode for reruns of ABC’s “Modern Family.” While the show has been successful on ABC, ratings have been somewhat soft, media buyers say, with an average of 611,000 viewers in the high-value demographic of 18 to 49-year-olds in May, compared with 1.1 million for “Big Bang Theory” on TBS, according to Nielsen figures provided by media-buying firm Horizon Media. USA’s parent, NBCUniversal, has had to compensate some advertisers with “make goods”—essentially running free ads to make up for low viewership, media buyers say. Still, the appeal of “Modern Family” to younger viewers has helped USA reduce the median age of its audience from 52.2 to 47, says Horizon Media’s Brad Adgate. NBCU is a unit of Comcast Corp. CMCSA +0.53% USA declined to comment. Further complicating matters for cable networks, viewers now have other ways to watch reruns, including streaming video services and video-on-demand. The serialized dramas that broadcasters are increasingly producing—shows whose story arcs play out over several episodes or seasons—have proved extremely popular on Netflix, NFLX -1.62% where viewers often “binge watch,” devouring multiple episodes at a time. Shows suited for binge-watching often don’t work as well as traditional reruns for cable channels. Aging stalwarts of cable aren’t packing as much punch. The audience for TNT’s reruns of “Law and Order,” a classic “procedural” show that isn’t serialized but instead plays out full story lines in a single episode, has dropped 20% since 2011, according to Nielsen. Big cable networks are investing in their own original shows. While some, such as“The Walking Dead” and “Mad Men” which air on AMC, AMCX +2.11% have become prominent, original series still make up just 7% of programming hours on big cable networks, factoring out their repeats, according to Nielsen. Some networks also are stepping up licensing of movies, and scheduling serialized dramas in marathons to accommodate viewers who want to binge on multiple episodes. And Turner’s Ms. Bradley argues that reruns will remain a big part of cable channel programming strategy. “We still believe someone will turn out another big hit—we just haven’t seen it,” she says.